Mike Lee has over 35 years of hotel marketing, sales and developmental experience behind him. For the last two decades, he has held senior management roles, working in many hotels and resorts such as Americana Hotels, Resorts International and Wyndham Hotels. Mr Lee was also the President of his own Franchising and Hotel development companies. 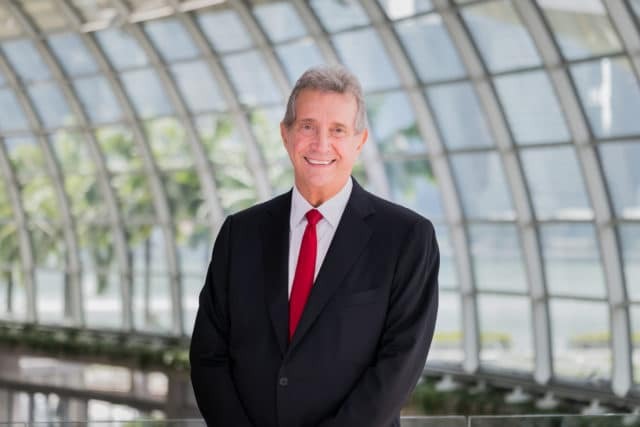 In 2010, he joined Marina Bay Sands where he is the Vice President of Sales. His role is focused on enhancing aspects of the Meetings, Incentives, Conventions and Expositions (MICE), Business and Leisure Tourism segments at Marina Bay Sands, with a primary focus on revenue responsibility. What we have been able to do is to help propel Singapore into one of the world’s leading venues. Q: Can you please share with our readers what the overall development and design vision for Marina Bay Sands is? The original concept of the Marina Bay Sands is to enable Singapore’s growth as a destination and be an international hub. Singapore has placed itself on the map within Southeast Asia and Asia-Pacific as a significant player in the MICE industry. What we have been able to do is to help propel Singapore into one of the world’s leading venues and our vision/intention was to be able to play to an international market and to bring in more international visitors. And we wanted to host as many of the blue-chip type of meetings and trade shows as we could. We deal in multiple market segments. The MICE portion of our business was the single most important piece of the jigsaw in getting this hotel open. That is what Singapore needed and that’s exactly what makes the MICE facilities that you have been to different here—it is what brings new business to Singapore, it is what event organisers are after. Q: You opened this building 8 years ago. Do you like the design, which is iconic and really special, or do you see any problems with it? I like it because it has become an icon so it’s easy for people to associate Singapore with Marina Bay Sands. But more importantly, from a commercial point of view, it is very functional. For meeting planners, this is a very functional facility; everything is under one roof, you can have events with food and beverages prepared by our banqueting team or have the option of ordering catering from our celebrity chef restaurants on site. It is all available within a single location. That is the main reason why I love the building. Q: And how do you see the meeting industry of Southeast Asia? What are the trends, what is going on? When I first got here, many people would say “Of course I know Singapore, I am very familiar with Singapore. What part of China was it in again?” It has changed since then. Partly because of Marina Bay Sands and partly because of how Southeast Asia has grown as a region as well, and people have become familiar with it. We used to bid on tenders, we would book out three, four, five years, and organisers would tell us “Well, our rotation is North America, Europe, North America, Europe, we are considering maybe doing the event in Asia, but we are not sure.” But then we saw a change. Event organisers are now going North America, Europe, Asia, North America, Europe, Asia, with Southeast Asia being a key component in that; so we have contributed to the change in the rotation cycles of these events. Since we opened in 2010, we have built a long list of success stories and managed to set record attendance for numerous events that have been held at Marina Bay Sands. We work hand in hand with the STB to promote Singapore and Marina Bay Sands as the ideal destination for hosting events in this region. Q: So all the promotion is really efficient? Yes, very efficient. They are knowledgeable, they work hard on things and they are cooperative with meeting planners—both in the prospective stage and right up to the execution stage. As a venue operator, we work hand in hand with the STB to promote Singapore and Marina Bay Sands as the ideal destination for hosting events in this region. We are constantly innovating and orchestrating unforgettable experiences. Q: What do you think the hotels should or could be doing better to improve customer experience? That must be quite a strange question for you, because I have to confirm that customer experience is really, really good, but I am asking anyway, what can be done to improve it? The younger generation is coming, millennials and so on. We are very familiar with that. I have two answers. One is the customer that has never been here and the other would be repeat customers. For us it is a little easier to promote to the people who have not been here before because we are able to put together specially curated programmes; we are able to do things that are very different from what they are used to. The repeat customers, on the other hand, are a little more fun because we have done everything that’s new and unique for them; now they come back and ask “What’s next? What are you going to do next?” We are constantly innovating and orchestrating unforgettable experiences for our clients through leveraging on the ever-changing products and services available at our property. It is about creating new experiences. The meetings portion is important and we are very good at that on a technical basis, but honestly, all the good places in the world overall are very, very good at that. What we do best at Marina Bay Sands is providing a new type of experience and making a difference by offering something unique they have never experienced before. Q: What is, in general, the secret of a successful MICE destination? I think you have to understand what the objectives are, you have to then tailor your product to achieve those objectives on a lot of levels, not just within the hotel, but you need the destination to work. This is a small country and you have, for example, international meetings for which 99 per cent of the attendees are coming from outside of the country—that means most of them are coming by air. There is a lot of coordination, a lot of logistics, you have to have a very deep understanding of what an individual customer’s needs are and you can’t get that unless you sit down very seriously with their operating folks and say “OK, where are they coming from?”; and if they are coming from India, then they might arrive at two in the morning, if they are coming from England they might arrive at nine in the morning … you have to orchestrate those rooms. It is not easy, but if you do your homework, you can do it. Q: Is the price connected to the sense of quality? We are most likely higher priced than the other hotels, but we also deliver a much higher level of product and within our product we have everything, it’s all there. If you are negotiating at this level of the blue-chip business, there is always that element of negotiating within the price. We used to have a problem with people perceiving us as pricy until they experienced the product. When they experience the delivery, they see all the different things that we can do, then that becomes more than acceptable for them, and it is not unusual for them to repeat their business with us. Q: Yesterday I met a lot of professionals (chefs, etc.) with really high, positive energy; it was not fake, in my opinion, you can really feel it. As a professional I can feel it. How do you maintain this energy? What are you doing with them? It is a good question and not easy to answer. It is real. How do we get it? These people love what they are doing. The HR policies are good, we have 9,700 employees. This property and this government spend more time than I have ever seen trying to make sure that the work environment is safe and all those other things, but also productive. Q: Privately, what is your favourite place in Singapore outside of Marina Bay Sands? Honestly, my favourite two places in Singapore are CUT and Spago (editor’s note: both restaurants by Wolfgang Puck and located in Marina Bay Sands).